halloween - 2 year anniversary with darren - daisy's scared of the fireworks! Hello lovelies! I thought I'd do a little update today as a lot has been going on in the past month! So, since my last update post, I've started a new job (again), I'm now working in a kids club while getting my NVQ in childcare. It's the perfect job for me as I work early in the morning, then again later in the afternoon, so I have all morning and early afternoon for my freelance beauty and freelance writing (and it's also a lot of fun working with lots of cute kids!!). That may answer a few questions as a few people seemed confused about what I was doing as I have been a bit all over the place in that respect! I've had lots of family, friends and boyfriend time these past few weeks too, which has been absolutely lovely. Darren and I had our two year 'anniversary' on Halloween, which was totally perfect, I've been Christmas shopping with my Mum and twin Sister Hannah, (who no longer lives at home as she's at uni, so it's lovely to be able to see her), seen all my Grandparents and been on several nights out with friends and family. This transitional time of year is definitely my favourite, it's been a very literally transitional time for me too! I always try to savor the Autumn and the run up to Christmas, as it all feels so magical and it's such a happy time of year. So these past few weeks have certainly been busy for me! What have you been up to lately? I love a post that has updates on bloggers instagrams. 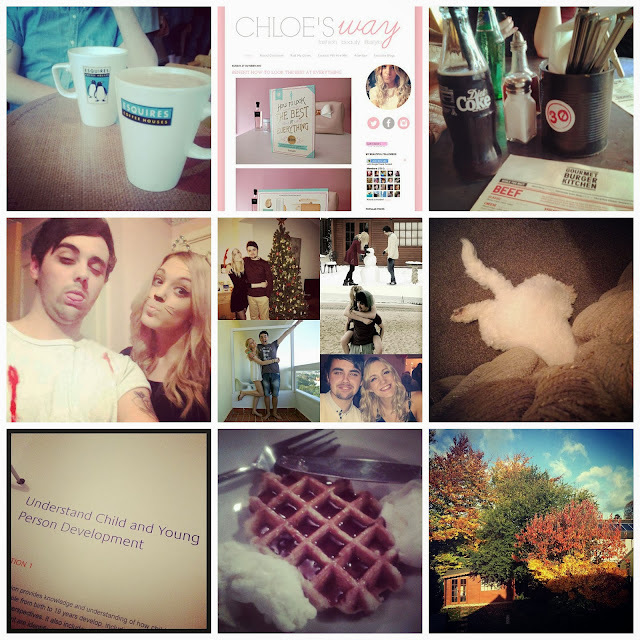 I have found that I'm not very good at following everyone so gives me a chance to catch up on recent instagrams.